The Tempest celebrated its 401st anniversary in 2012 and yet our landmark Aboriginal/European production showed how the play is as pertinent today as it was when first written in 1611. Full of magic, myth and murder the story centres on Prospero, the deposed Duke of Milan, whose evil brother set him adrift with his infant daughter Miranda, in a leaky ship 16 years before the play begins. Prospero and Miranda are washed ashore on an island and make a home there by enslaving two aboriginals of the island: Caliban who represents the land, and Ariel who embodies the air. Prospero uses his mystical, white magic to control Caliban, Ariel and all the spirits of the island. Fortuitously, Prospero’s brother and the King of Italy sail past the island on their way back from a wedding; this is where the actual play begins, as Prospero raises up a terrible “tempest” and shipwrecks his persecutors in order to extract revenge. The play develops into a love story as well, when Prospero manipulates a meeting between his now-16 year old daughter and the King of Italy’s son, Prince Ferdinand; as expected, the two fall in love but are romantically kept separated. At the same time Caliban is led astray by two drunken sailors who introduce him to alcoholic drink and corrupt his innocent nature. The rest of play cuts back and forth between the rescued royal household, Prospero’s magical machination of events, and the manoeuvrings of Ariel and Caliban to be free. The thematic concerns of the play centre around issues of colonial acquisition and usurpation of land, the displacement of aboriginal peoples, the reculturalisation of the indigenous population and the ensuing contention of enslavement and aboriginal spirituality. These issues are still pertinent today as they were 400 years ago, and are highlighted in this groundbreaking production. Julie Herne in The Australian Stage: Stylistically, the most traditional play of the season is The Tempest. It was in this production that the costuming most impressed me. Overall, The Tempest is well designed and delivered, and purists will not be disappointed. Ron Banks in The West: The Tempest is a blend of the surreal, the fantastical, [and] the magical and the earthly desires of characters who need to be shown through the magic of theatre how to become kind and compassionate. Sam Longley uses his lanky frame and mobile face to make a meal of the comical Trinculo with the equally comical Claire Munday as his partner in crime Stephana. Their scenes with Ryan’s monster Caliban are well calibrated to extract maximum amusement. 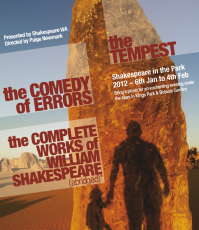 The Tempest is Shakespeare at his most creative, with this production [is] well-disciplined and confident of realising the playwright’s intentions to mix the profound with the magical. Sarah McNeil in The Post: The Tempest is set in Elizabethan times with fabulous costumes (Ingrid Proos) and a brilliant, insightful interpretation that sees a ship wrecked on the coast of Australia. Despite some lackluster performances, it is this interpretation with the white man’s introduction of religion, language and alcohol to an indigenous people that makes for a fascinating and far more relevant version than its counterpart with its contemporary setting.